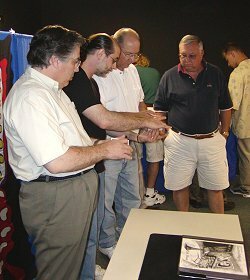 Very few lecturers, and I have seen many, have the understanding of magic, mentalism, and how to entertain with them that Rick Maue has. He is not only an excellent teacher of what to do and what not to do, but his own performances in the lecture demonstrate his understanding. I not only urge you to catch his lecture, but I also urge him to keep lecturing, for what he is saying and doing is very important. The Final Picture; and the upcoming Occam's Magic. Rick's current lecture contains items from just about all of his releases. Routines range from mentalism, to standard magical effects, to haunted items. In addition, a number of utility moves and techniques are demonstrated. The lecture runs over two hours, and it is structured very much like Rick's books in the fact that the emphasis is on presentation. This means that he will discuss not only "how", but also "why" the routines are designed in the manner that they are. But do not fear, each point is illustrated with effects that are technically very easy to do, and they do not require special gimmicks or equipment. You certainly set the standard at the convention. I am so glad that I got to see you lecture. Rick Maue is one of the most entertaining mentalists I have ever worked with. Whether performing magic or mentalism, his style is totally unique! Rick Maue's lecture absolutely blew me away. The material was strong, the theory was solid, and it is obvious from the first minute of the lecture that Rick CARES about his craft. I can't wait to see it again. Rick, I like the way you think! I'm having fun with a number of routines from your current lecture, especially Terasabos. Great Stuff! The thinking behind the effects here is fascinating...simple in method and heavy on effect. These are the kinds of things that should be of interest to all of us. There are many lessons here. Well worth the time. I feel like I am watching a mad scientist at work? Rick Maue presents an outstanding lecture. He is the rare combination of a great artist and a successful businessman, and this is reflected in his material. with some great original ideas and concepts. More importantly, people will leave with the confidence and motivation to improve what they already do. An evening with Rick Maue is a delight, and time well spent. One of the many things that I enjoy about Rick Maue is his sense of the theatrical. He can make simple things very important to the audience. Then again, Rick can floor you with an absolute miracle, and the key element to performing a miracle is daring to do it. Rick proves that too. In short, Rick has a little something for practically everyone in his lecture. Rick is an outstanding thinker and creator. His inventiveness transforms mere tricks into true miracles. And most importantly, he is one sick puppy. I would not even be in the world of magic. Rick's lecture is different. Rick's lecture is entertaining. Rick's lecture is good. If you are looking for solid magic with interesting presentational approaches, look no further. Rick Maue has one of those truly fertile minds, capable of creating wonderful new routines from old fodder. His routines are original, theatrical, mind-boggling, and above all, entertaining. I am totally blown away by his creative process and his thinking. Attending one of Rick's lectures is an experience that you will not want to pass up. Man, Rick is great. I love him. 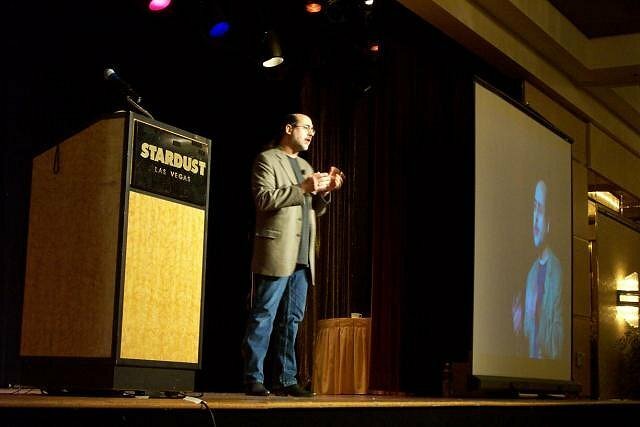 The lecture was a brilliant demonstration of the use of marketing in magic. Rick held an appreciative audience spellbound as he revealed startling effects that required only simple means to demonstrate supernatural powers. It was his attention to presentation, wording, and dramatic impact that made this of such great interest to all of us whether we were interested in bizarre magick or not. Rick presented a most enjoyable lecture for us. His blend of expertise covered a little something for everyone. His mental stuff is superb. He blew us away right from the start. Interspersed with the effects were well thought out discussions about establishing a relationship with the audience, and the obvious effect this has on audience management. All of the effects in Rick's lecture were well presented and entertaining, and offered useful material covering a wide range of magical interests, from card 'finger-flingers' to bizarre magicians. I was anticipating Rick Maue's visit to our place (Ronjo Magic) for quite some time now. I had the expectations of watching a strange man dressed in black, lighting candles and doing unusual things with tarot cards. His presentations would be a welcomed change from the typical normalcy of cards and coins. us. This man was not a demon dressed in black nor did he light any candles (although he did talk about lighting some). He used plain old cards and would you believe it, he hardly did any magic at all! Apart from being a great teacher, thinker and innovator, he is a very nice person. His show was informative, exciting and fun. Rick also gave us something that no other lecturer has ever given to us before. He gave us the gift of our own minds. He taught us things we didn't know could be taught! He showed us how to be creative. Yes, we actually learned how to invent new effects and come up with original presentations derived from old or stale props and routines. We learned why ideas come to us and how to make them useful. Now that's powerful. But we learned so much more that. More than I can say if a few words without going on and on for hours. area, make sure you attend. His lecture has something for everyone, even if you don't like the idea of Haunted Magick, you will learn how to adapt his ideas into your own way of thinking. He cares about his audience, his art, and conveying his art to his audience. We're lucky to have him in our art. Let's go to the bottom-line: Mr. Maue's presence, voice, look, and manner convinced me that he probably could read my mind. He has incredible style in his presentation and exudes the confidence of someone who has done this once or twice before...Mr. Maue performs magic that improves on the state of the art and matches it with scripting and presentation methods that make it a work of art.